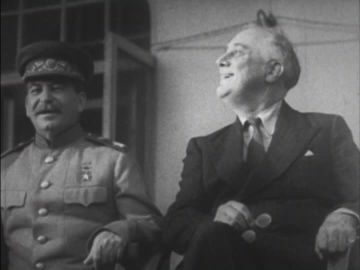 Stalin finds that he has friends in the Roosevelt family after Churchill objects to his proposal to murder 50,000 Germans. “Compromise,” the American magic formula for solving insoluble problems at this time also has something disturbing about it for the English. Also disturbing is the menacing laughter with which not only the Russians but even the Americans approve the “wit” of their president. Decades later, one would still like to doubt whether a democratic president who had led his population into war to preserve humanity and justice could, with such cynicism, consent to the murder-plan of the Red Genghis Khan. But we get our account of this scene from his own son, Elliott. The younger Roosevelt participated in the evening session of the Teheran Conference. In his book As He Saw It (Duell, Sloan,and Pearce), published in New York in 1946, he narrated all the details for us (pp.188-191). Eleanor Roosevelt wrote the foreword, so that that this account is authenticated by the president's own family. Son Elliott reveals that Papa Roosevelt “smiled furtively” during Stalin's first toast to the murder of 50,000 officers. Stalin seems to have been wounded by Churchill's reproach of “infamy” not so lightly as it initially seemed. That Staling was not merely trying to make one of his uncouth jokes, Elliott's revelation proves; Stalin subsequently approached the scion of the war-president, seeking support. Stalin beamed with satisfaction. He came around the table and laid an arm around my shoulders. An outstanding answer! He drank to my health. I blushed with joy. Churchill was still furious, finding no relief even in brandy, and left the opulent table early, apparently in a thoroughly bad mood. Perhaps he was harried in his dreams by the disturbing crimes of Katyn, about which he must already have known at that time. Why was Stalin supposed to proceed more cautiously with Germany's military elite than with the Polish military elite? Why was he supposed to exterminate German and Polish class-enemies less brutally than the Czarist nobility, the Russian intelligentsia, the Slavic farmers, and all other opponents of his dictatorship? Roosevelt's assent to Stalin's Mongolic methods – the slaughter without trial, the total negation of all Western principles of justice – had shocked Churchill because it was unexpected. How would the public of the democratic world react to such brutalities?